Copy the ffire.bsp file into your gearbox.maps folder. Pointless. You just kill about 30 marines, then you find barney and some scientists. I like pointless things! Broken link. 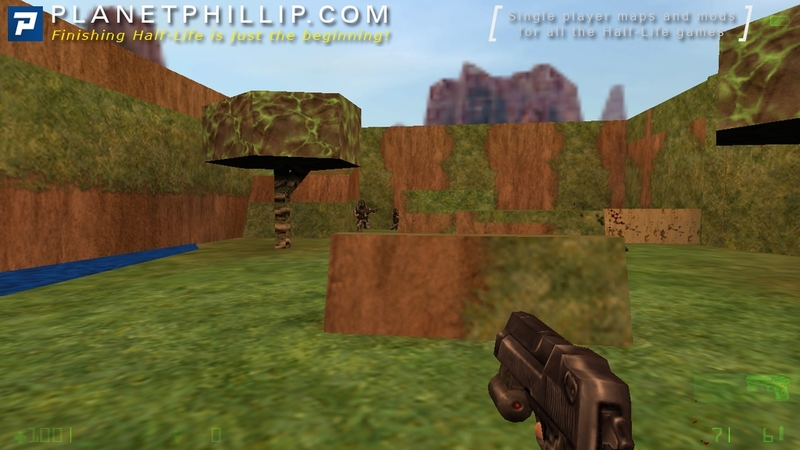 This better not be the trend for Opposing Force levels, because this is awful. Strangely, although it is an Opposing Force, it’s still a grunt-fest (rather than a Black Ops fest). 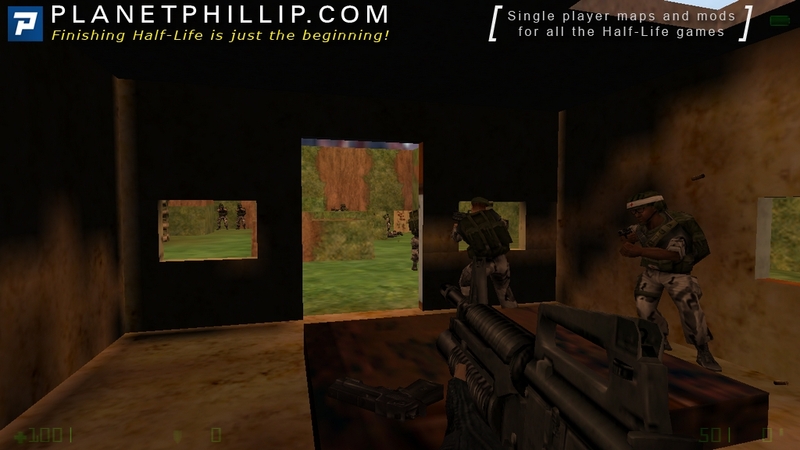 You start in a small hut with a squad of 4 of the friendly Opposing Force marines, surrounded by an outdoor area filled with the standard Half-Life marines who want to kill you. Perhaps the old marines are angry because the new marines have stolen their jobs and have decided on taking revenge against Adrian and chums. Whatever the logic behind the design all it really amounts to is you using the Desert Eagle to gun down some marines. Couldn’t we have some originality for a change, please? Combat lasts about 30 seconds as the old marines immediately run forward and get killed by superior fire power. However, the new marines also die fairly quickly because their AI can’t get out of the hut. It’s comical to watch them stand still and take a beating. More care should have been taken to make sure the AI could cope with the layout. I was actually surprised at how powerful the Desert Eagle was – it allowed me to kill most the opposition in a few seconds. In comparison the MP5 seemed pathetic. The speed with which this can be completed and dull nature of the simplistic combat makes the whole thing pointless. The map ends with a small tunnel leading to a couple of Barneys and a scientist. Being slightly bored I killed them and then my own remaining squad of marines (I’m evil, I know). That seemed to be the end of the map. What I’m trying to say is that this level has no proper ending, doesn’t last long and doesn’t provide a high quality of combat. 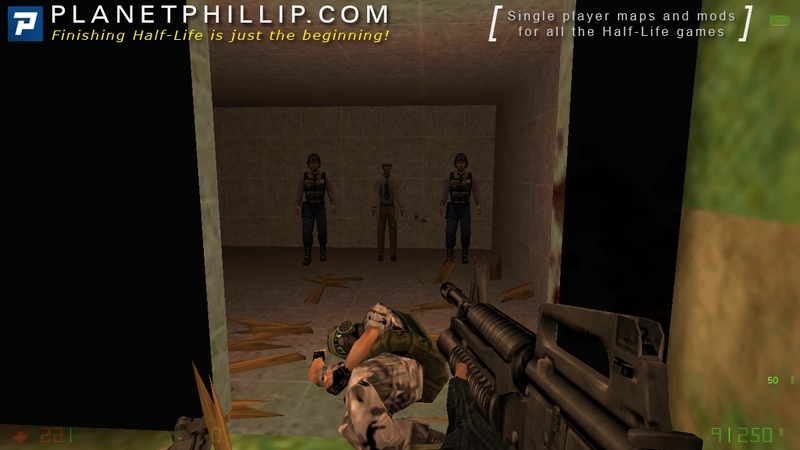 The only thing that suggests this is an Opposing Forces map is the presence of four friendly marines, a Desert Eagle gun and some new textures. 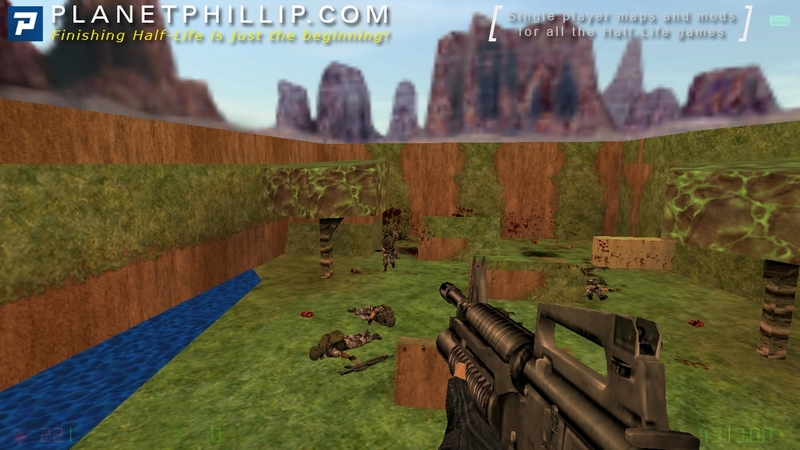 It seems to be only a gimmick that it’s based on Opposing Force. I’m hoping that sooner or later a level will come along that makes full use of the new weapons, monsters and characters (personally I think the new stuff is very cool and the amateur authors ought to be able to use it very well), but this isn’t it. Don’t bother to get this one, even if the novelty attracts you. This review was originally published Monday, 24th January, 2000 by Chris. This must have been one of the first Opposing Force releases and it probably gave a lot of people a scare. “If this is what people are going to release then I don’t want to play any more!”. I can imagine a few people said something similar to that. You get to shoot a few grunts and have nothing else to do. Let me put it this way: The map is 49KB and one full-size screenshot is 250KB. First run crashed, second run everyone is shooting at me before I even move, third run (and now ready for it! ), kill every one! Looks!! look at the trees outside they show how bad the looks are! Wow, that was the most incredible thing I ever played. There was an amazingly deep storyline that made Sheakepeare look simple, the graphics were better than the Mona Lisa, and the gameplay was so intense I thought it was real! This was beautiful!!!!! Yes, that was sarcasm – it was almost as painful to write as it was to play this map. 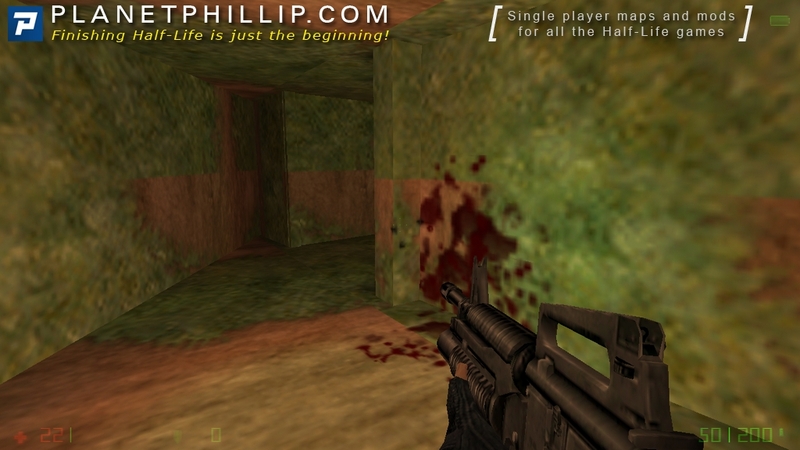 It’s a big box with some horrid grass textures, a few other blocks for cover and a meaningless corridor. Chuck in a few marines (friendly and enemy) and that’s all there is. Small filesize looks suspicious. When I launched it, the game freezed. That isn’t good. Worked after second attempt. The design is a poor attempt to draw a landscape. Flat cliffs, awkward trees which use Xen textures. If you get to the roof, then get on the railings and jump, for a short while soldiers will disappear and sky will turn into “hall of mirrors” effect. 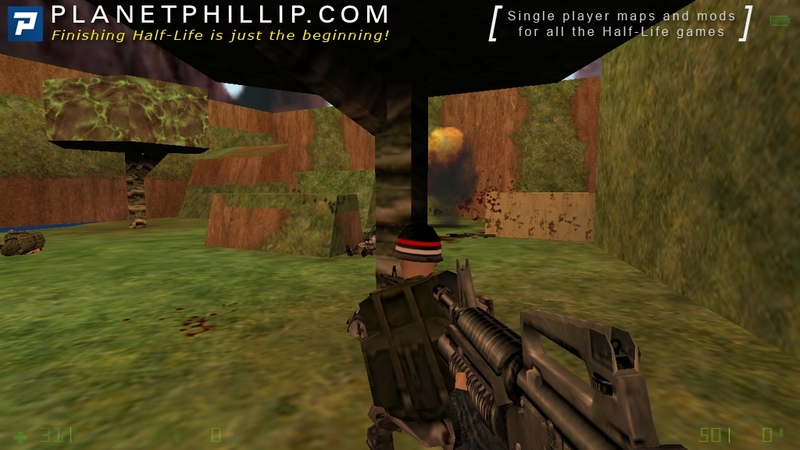 The gameplay is fun: we and friendly soldiers fight a squad of hostile soldiers, since enemies are distracted, we can take strong pistol and give headshots left and right. There are cover spots, which is good. Then we get to the scientist and nothing else happens. Deserves one star for well made gameplay, but it has nothing to offer besides it. 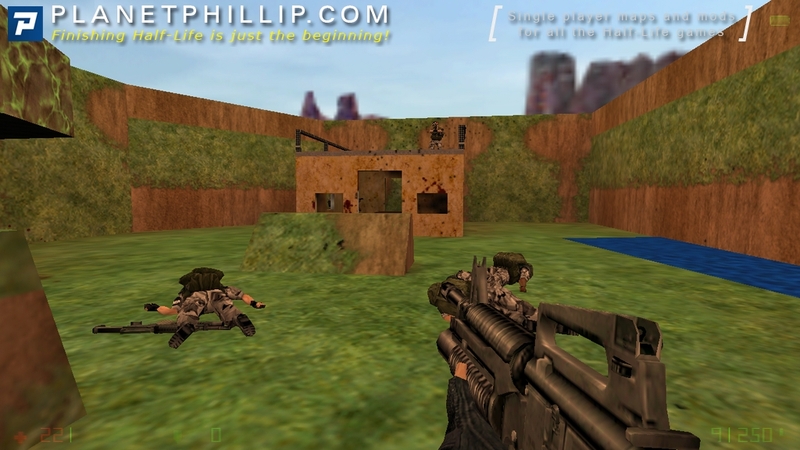 This was maybe a cool thing back in 1999, now it seems just like a front vs front arena is not much than that, I actually found it quite challenge if you place the skill on hard, and provide yourself with impulse101, and use it to practice with your sniper riffle then kill everyone including your side team in order to do some shoot and run tactics…, but well that’s how I played it, appart from that is quite a terrible map, but we can’t be so much picky on the first loosy releases, can we?? Play it o.ly if u are a big fan that plays all. Play it only if u are a big fan that plays all. I had to change the sound quality to low for this map because it crashed at the start because there were too many sounds at once (a common HL1/OP4 problem). This, along with J2000 and Fallen Chapper, is some of the worst OP4 maps have to offer. This really feels like an abhorrent HL1 map with some OP4 entities tacked on (we couldn’t even fight some Massn’s?). The texturing does not fit at all and it’s attempts at “realism” with the tree is just laughable. The map doesn’t even have an ending or any indication of such! I have no idea why someone would give this anything above a AI. Yeah this is yet another terrible map that happens to have some Op4 weapons thrown in. We knew it in 1999 – it was a terrible map then, it’s a terrible map now. Not even worthy of a full paragraph. Avoid.